Sunday Snippet, Let us give thanks. Rachel stirred in bed, woken by the ringing of the none too distant church bells. She sat up, blinked, and fought back the panicked feeling that she was in a strange room. The late afternoon sun flooded in and filled the room with an amber light. She wasn’t in that boat, this was a room. Not her room, but a nice one nonetheless. The bell had finished tolling and the congregation was halfway through the first hymn when Rachel tried to slip unnoticed into the back of St. Mary’s. Even though the singing continued, it felt to her as if everyone in the room turned to stare. I can’t run. Rachel curtsied, and then found a seat in a pew in the back. As everyone started to recite, “Almighty God, our heavenly Father.” Rachel thought, I must have been exhausted to sleep this late. “Forgive us our sins,” the prayer continued, “In what I have done,” What I had to do, “and what I failed to do.” They may have survived. Hope not. “Forgive us, O Lord.” Should I ask forgiveness for hoping they didn’t? I’m walking. As my ankle recovers I’m discovering the muscles that haven’t been used as much in the last few months. I’d been warned about back pain and did a fair number of leg lifts. That worked, but the long muscles that connect the thigh to the big toe are letting me know they don’t like the situation. Fortunately stretching makes a big difference. I moved from my Philmont boots to a pair of trail runners, the same type as I used in Wales last summer. It hasn’t stopped me from field research this summer. Bits of folk religion show up in the oddest places. This little statue, at the Devil’s pulpit above Tintern Abbey on Offa’s dyke, seems to represent some forest spirit or old goddess. 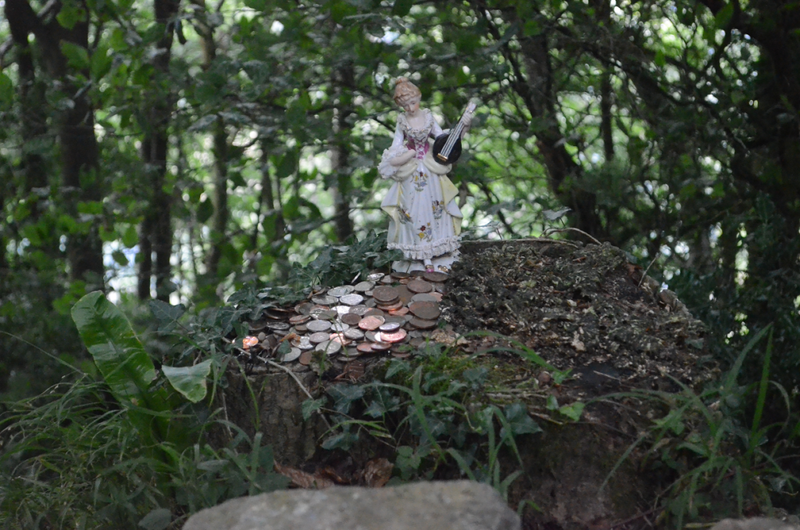 There’s a large pile of offerings on the stump beside her. Author rharrisonauthorPosted on July 9, 2017 Categories A Formulaic Romance, Chemistry, historical background, WritingTags England, Historical Novel, regency, Writing12 Comments on Sunday Snippet, Let us give thanks. Sunday Snippet, Going for a Swim. Rupert showed he has something that connects his shoulders to his hips. Last week, the start of a new chapter shows that another of his talents is important. We discovered why it was so important that Rupert come with Sir Roger recently. Rachel awoke below decks in a ship (a channel barge). Despite the sterling reputation of the English as cooks, the crew ask Rachel to cook for them. Her choice of seasonings has their desired effect this week. “Good lass.” The officer stifled a laugh. Moments later, he joined the debris in the river, followed shortly by his compatriots. The boy, who led this stage of horses, didn’t bother to look back at the splashing. He’d been warned and well paid to ignore anything the ship dropped over the side. Besides, ships always dumped their slops overboard. It wasn’t until he reached Hook and stopped to change teams that he noticed anything amiss. I’m walking. Not without pain, and not without a little bit of a limp, but I’m walking. It turns out, if you’re ever in this situation, that it’s important to restore flexibility. You can walk through the pain. I moved from my Philmont boots to a pair of trail runners, the same type as I used in Wales last summer. It hasn’t stopped me from field research this summer. 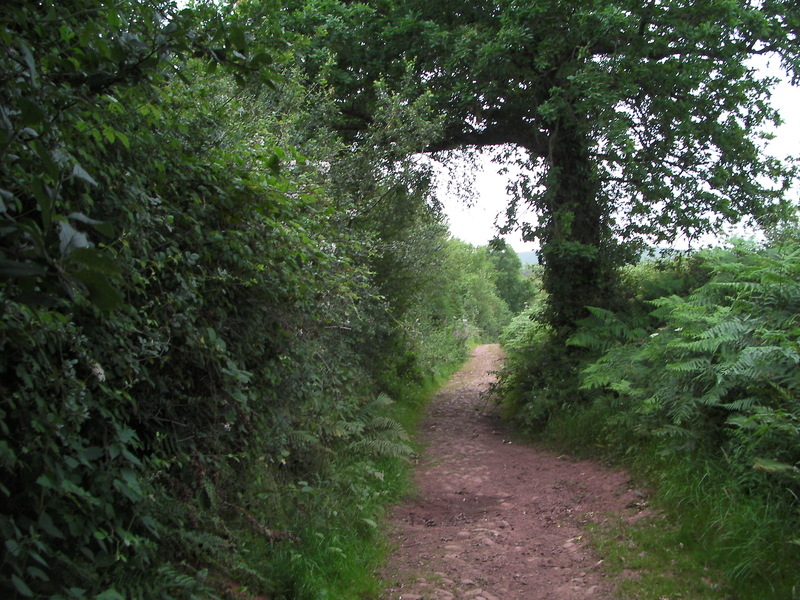 A sunken path in Exmoor. I expect Exmoor will feature in one or the other of our next works. Author rharrisonauthorPosted on July 2, 2017 Categories A Formulaic Romance, Chemistry, historical background, WritingTags England, Historical Novel, regency, Writing11 Comments on Sunday Snippet, Going for a Swim. Sunday Snippet, Sometimes I take a calomel for my headache. Rupert showed he has something that connects his shoulders to his hips. Last week, the start of a new chapter shows that another of his talents is important. We discovered why it was so important that Rupert come with Sir Roger recently. Last week, Rachel awoke below decks in a ship (a channel barge). “Vive L’Emporer.” Lars and the other hand snapped to attention. Rachel said, “Untie me. I’ll behave.” Until I get a chance. Something tells me I’m due for a swim soon enough in any case. Rachel, as directed, stayed below until the ship was cast loose from the harbour. She felt it gently sway as a team of horses pulled the bow around, and then along the bank. The barge stopped, tied to the side of the first lock on the Ouse. Rachel felt it slowly sink. A sinking feeling that matched her worries. Then she heard the gates open, the boy on the horse team call, and they were off. Down the twisty Ouse river and toward the North Sea. By the time they allowed Rachel on deck, the sky had darkened into night. Not that it stopped the tow. It might as well have been on the moon. “Just cook something good for us to eat.” He turned and left her alone. Moments later Lars and the other hand joined him. They hung over the edge of the gunnel, alternately squirting from both ends of their digestive tracks. Rachel smiled to herself. So that bottle really was calomel, good. Then she grabbed a knife from the table and ran, unnoticed, to the front of the hold. I’m walking. Not without pain, and not without a little bit of a limp, but I’m walking. It turns out, if you’re ever in this situation, that it’s important to restore flexibility. You can walk through the pain. I moved from my Philmont boots to a pair of trail runners, the same type as I used in Wales last summer. English food is something of a running joke to the French. It’s not that bad. Actually, it’s excellent when properly prepared. The thing is, the Brits do not complain. Well, they do, but very moderately. “I’m not exactly keen on this,” means “I loath and detest it.” So you can survive cooking awful food in a British restaurant – at least for a while. Amelia reminded me to put a link to our book page. The first book in our series, The Art of Deception is now available for preorder with an extract on instafreebie as a teaser. Author rharrisonauthorPosted on June 17, 2017 Categories A Formulaic Romance, Chemistry, historical background, WritingTags England, Historical Novel, regency, Writing3 Comments on Sunday Snippet, Sometimes I take a calomel for my headache. Sunday Snippet, A fine and private place. Rupert showed he has something that connects his shoulders to his hips. Last week, the start of a new chapter shows that another of his talents is important. We discovered why it was so important that Rupert come with Sir Roger last week. Rachel awoke to gentle rocking, a splitting headache and in damp dark panic. A panic that having her hands and feet bound did not help. The smell of the bilge rose up to greet her. She retched onto the deck, and that only improved the smell. “Awake, my pretty?” Somewhere behind her, one of the sailors noticed her stirring. His heavy accent suggested he was from the Baltics, and not the nice parts of the Baltic coast. “What?” words came slowly to her mind. She’d been grabbed, something forced into her mouth, then nothing. She wanted to scream, but the sound wouldn’t come. “Lars!” Someone called from above deck. In the process, despite her tied feet, Rachel made a creditable attempt at kicking him. Rachel gagged on the rag Lars shoved in her mouth. The best thing it tasted of was pine tar from the spars they shipped from the Baltic. The worst things were unmentionable. Slowly, with her tongue she pushed it forward, eventually out. The horrible taste washed the panicky fear from her mind. There’ll be time to panic when I’m free. She wanted to scream, but without anyone bar the sailors there, next time Lars would tie the gag in firmly. If she made a noise, it would have to be heard by someone who could help her. “Was ist es?” Lars, pretending he didn’t know English. Saint Helena is a small volcanic island in the middle of the South Atlantic. Almost literally the most remote place on Earth (I suppose the south pole and Easter Island are more remote, but not by much.) Since Napoleon could not be trusted to stay put, it became his final abode. The Xkcd comic is appropriate here. It must have seemed like this to the British. . Author rharrisonauthorPosted on June 11, 2017 Categories A Formulaic Romance, Chemistry, historical background, WritingTags England, Historical Novel, regency, Writing7 Comments on Sunday Snippet, A fine and private place. Rupert showed he has something that connects his shoulders to his hips. Last week, the start of a new chapter shows that another of his talents is important. We discover why it was so important that Rupert come with Sir Roger this week. Rupert rose, “If you’ll pardon me.” Then he followed the innkeeper downstairs. She arrived downstairs just in time to see Sir Roger lead Rupert out of the building. Something was amiss, but Rupert went with him voluntarily. She followed, equally willingly, and with even more curiosity. “Not yet,” Sir Roger said. They didn’t walk far before they came to the broken remains of what once had been a handsome half-timbered building near the shipyards. A constable, with the help of several soldiers, who had been on leave, held back the interested bystanders. “I still don’t see, Sir Roger, what this has to do with me?” Rupert said. “Here My Lord. This was in the street.” The constable bowed and handed him a tattered book. The cover bore his name. “My Lady, please. That’s evidence.” Sir Roger quieted her. He nodded, unwilling to take his eyes off Rupert. Rachel followed the maid towards the Hart. She never arrived. The part about nearly leveling the Tower of London is true. It did not take very long (less than four years – he patented the pill-bottle lock in 1807 and the synthesis of fulminate was published in 1803) for Alexander Forsyth to invent a reliable firing mechanism that used mercury fulminate. It was, and like modern percussion caps is, a far more reliable way to fire a gun than a flintlock. Having actually fired both percussion and flintlock rifles, the flash in the flintlock pan (it will burn your face and makes safety goggles a must – unless you don’t mind wearing an eyepatch) and its propensity to hangfire if you don’t do everything exactly right makes the flintlock only suitable if you don’t have anything better. The British Army agreed and hired him immediately. It was then, while he worked at the Tower armoury that they discovered the fulminate’s untoward propensity for going off in an interesting and energetic way did not diminish when you had pounds rather than ounces of it. Forsyth turned down an offer of L20,000 pounds from Napoleon for his discovery. I guess he wasn’t a member of the SNP (snark). Sunday Snippet, Things heat up. Last week Rupert showed he has something that connects his shoulders to his hips. This week, the start of a new chapter shows that another of his talents is important. Rachel enjoyed the morning, with Rupert supporting her arm while they walked. Charity, for all her purported weakness and delicacy didn’t seem to require the support. They were going to see the boatyards on the Calder, and then when the excitement of watching a sloop slowly being assembled paled, find a nuncheon nearer the centre of town. They had started walking back into the town, when Charity shouted “Ouch!” and started limping. “What is it?” Concern evident in Rupert’s voice. “Needs must.” Rachel removed her arm from his support and stood there while Charity took his arm. Not much of a limp, is there Miss Deacon? The York, the closest inn, had no parlour suitable for genteel company. Rachel watched as that tall, yellow-haired hussy walked with her fiancé’s support in front of her. To make matters worse, they chatted with an easy familiarity about topics beyond her education. Greek, classical myths, literature, even natural philosophy. They soon, all too soon for Charity and none too soon for Rachel, reached the Hart and Rupert went inside to negotiate a private parlour. While he was inside, a shock wave rocked the street, followed by a loud rumble and the crashing of a broken building. It could have been thunder from a nearby lightning strike, except that the sky was clear. Around them the horses bucked and whinnied, all except those too tired to care. Glass rained from windows further down the street where the shock had been stronger. Seated at table, in an upstairs parlour, Rachel asked him about that time in Cambridge. Rupert explained his remarks, “One of my … late friends. He tried different fulminates, managed to make a mixed silver and mercuric one. Stable enough when wet to accumulate a few ounces.” He lapsed into silent memory. “It wasn’t stable, was it?” Rachel asked. One of the key things to staying alive when making organometallic compounds, especially ones that are not exactly stable, is purity. Mercury fulminate is more or less safe to handle. Copper, silver, and gold fulminates … aren’t. Not at all. If you start from an amalgam (a mercury alloy) you get all sorts of interesting things. None are safe. (it also helps to keep control of temperature and have clean nitric acid.) I must add that none of these are reactions that anyone who is concerned with longevity or fingers should attempt. Author rharrisonauthorPosted on May 28, 2017 Categories A Formulaic Romance, Chemistry, historical background, WritingTags England, Historical Novel, regency, Writing10 Comments on Sunday Snippet, Things heat up. This week Rupert shows he has something that connects his shoulders to his hips. Mr Brindle managed to keep his face expressionless as he bowed to them, “It will be my pleasure, and I’ll see that the carriage is here later this afternoon.” Rachel sighed with relief as Rupert escorted her and Lucy down the High Street. She turned and saw Brindle go into the Hart, calling for the keeper. Rachel glanced at him, and Miss Deacon. She’s so pretty, even in distress. Rachel followed Rupert’s gaze when he addressed Lucy, but stopped on Charity. She likes him, more than a little. Possibly more than George. Pity she’s engaged. She smiled to herself. The thought Pity he’s engaged, passed through her mind and dampened her good humour. Studying Lady Bedlington’s expression, Rachel thought, for the moment, until there’s something else she can do. I have to apologize on being a little remiss at replying and various social obligations. It is surprising what a broken ankle will do to your energy level (Even after several weeks, it’s mending but a royal PITA – It’s better in that I can put weight on it, but three more weeks a couple days with the boot. Here’s hoping. I’m getting antsy to ride my bike – the one with a decent sized motor – though I might have to follow Red Green’s advice.). Sal Ammoniac, e.g. Ammonium chloride, is a neat chemical. It deliquesces into a fine white smoke when heated. It’s sometimes used for stage smoke – when they don’t use dry ice and hot water or an oil burner. It also has one heck of a heat of solution. When I was a lab tech in high school, I was told to make a saturated solution of ammonium chloride. The usual trick for salts is to heat the solution, add the salt until it can’t quite take any more, and then when it cools a small amount of the salt precipitates – which ensures that the solution is saturated. I started with NH4 Cl and kept adding it, and kept adding it, and kept adding it. Eventually I could add no more. Then when it cooled there was a small amount of water and a huge amount of ammonium chloride in the bottle. You can also make it from gaseous HCl and NH3. We did an experiment measuring diffusion, where you put drops of this solution on either end of a tube and measure a band of smoke where the two gasses meet. That worked, but one of the highlights for me of highschool was making the entire wing of the school foggy. They didn’t repeat that experiment the next year.